The content of this article provides interesting history, facts and information about Life of a Gladiator. The Life of a Gladiator could be strict and harsh, especially for new recruits to the gladiator schools. During the period of the Roman Republic the newly recruited Gladiators were at first conscripted to the gladiator schools from slaves, criminals and prisoners of war. They had no choice. They were forced into the roles of gladiators. Some were sentenced 'damnati ad gladium' meaning they were condemned to death either by execution by sword or to fight until dead as a gladiator. These new recruits were heavily guarded they had no freedom. When a new recruit, called a novicius entered one of the gladiators schools he was assessed by the lanista (owner of the school), a doctor and the trainers. He would first be checked by a medici (a doctor, not to be confused with the doctores) to ensure he was fit. Their physique would be assessed and a decision made as to what type of gladiator he would be trained as in the gladiator school. Would his physique be suited to wearing heavy armor or would light armor be preferable? At first the majority of gladiators were taken as prisoners of war. There ethnic background was reflected in the type of gladiator they would be and they would wear the armor and use the weapons of their homeland. Thus, some were called Thracians, Gallus and Samnites. As time moved on into the era of the Roman Empire old enemies became allies and gladiators were named according to the type of fights they fought in or the weapons they used e.g. Bestiarii (Beast Fighters) or Retiarii (Net Fighters). The lanista and the trainers of the gladiator school made the decision how they would be trained and the type of gladiator that they would fight as (see Types of Gladiators) - the life of a gladiator was totally pre-determined. The Gladiator trainers who worked in the school were often retired gladiators who specialised in specific styles of fighting and weapons. The trainers were called Doctores. A Doctor who trained the type of gladiator called a Retiarius would be referred to as Doctores Retiarii whereas one who trained Secutores, was called Doctores secutorum. The life as a gladiator started as a raw recruit who were called novicius. When they had completed their initial training and were ready to fight in the arena they were called Tirones gladiatores or Tiro. The Tirones often had tattoos applied as an identifying mark on the face, legs and hands in order to make it difficult to hide if they escaped. The life as a gladiator and his training at first concentrated on getting the new gladiator to the peak of fitness. Their initial training did not involve using highly dangerous real weapons,. Wooden training swords called the the rudus were used (lusoria arma). Gladiator Training focussed on the different fighting styles and weapons required by specific types of gladiators. Gladiators who fought in heavy armor were slower and required different techniques and skills than those of the gladiators who were lightly armed, who were fast and light. The different types of gladiators required customised training according to their armor, weapons and fighting techniques. The life as a gladiator started at dawn when their cells were unlocked and they were sent for the first meal of the day. Strict discipline was enforced and new gladiators were not allowed to speak at mealtimes and were bound in shackles unless they were training. New Gladiators were watched and guarded at all times. The new gladiators were seen as valuable commodities and were therefore well fed with a high protein diet. The life of a gladiator included eating three meals a day. The roman gladiator's diet consisted of meat or fish, bread, cereals and vegetables. Other types of food included barley, dry fruits, cheese, goat milk, eggs and olive oil. The gladiators drank only water. The life as a gladiator included attention to personal hygiene. Gladiators were given frequent massages and allowed to take hot and cold baths. When so many gladiators were forced to live in close proximity the medici would ensure that the threat of diseases and infection were kept to a minimum. The life of a gladiator in terms of food and living conditions was therefore often superior to the lower class of Romans. The monotony of living the life as a gladiator was sometimes lifted when women were provided for the gladiators. These women were usually slaves who worked in the kitchens of the gladiator schools. The gladiators were usually allocated the women by the guards or trainers. The Life of a Gladiator held some appeal to free men. The living conditions of gladiators were good. And the role of a gladiator could be highly lucrative. Gladiators were paid each time they fought and they were allowed to keep any rewards and purses of money. The most successful gladiators were also treated like modern day 'Pop Idols' with fan worship, fame and glory. It is therefore not surprising that some free men enrolled as gladiators. These free gladiators were ex-soldiers and some were wealthy Romans who craved the adulation and the glory given to gladiators. Other free men simply needed money to pay off their debts. Their living conditions were much better than the conscripted gladiators and they were given much more freedom and were allowed to leave the gladiator schools, or barracks. In addition to this most gladiators were only expected to fight 3 - 5 times a year. So which was better life as a Roman Gladiator or life as a Roman Soldier? The day before the gladiatorial games a public banquet was held for the gladiators which was called the coena libera. During this feast the gladiators were all determined to enjoy themselves as they were all aware it could be their last meal and their last day in the life of the gladiator. The life of a gladiator was lived on a knife edge in that he knew that he would have to face death in the arena. Roman gladiators were even taught how to die. They were expected to die with dignity, honor and no complaint. They were never allowed to show fear. 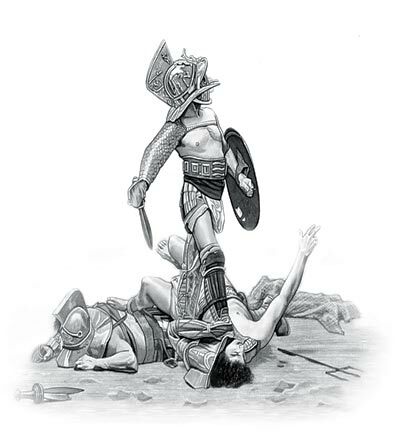 Free gladiators had to swear an oath (sacramentum gladiatorium) and enter a legal agreement (auctoramentum) agreeing to submit to beating, burning, and death by the sword if they did not perform as required . The content of this Life of a Gladiator category on life in Ancient Rome provides free educational details, facts and information for reference and research for schools, colleges and homework. Refer to the Colosseum Sitemap for a comprehensive search on interesting different categories containing the history, facts and information about Ancient Rome. Just like the subject of Life of a Gladiator there is hardly a page of Roman history and the Romans that is not, on some way, connected to the Roman Colosseum which became a symbol of Rome, its society, culture and life.